The sequel to AN EMBER IN THE ASHES, that�s captivated readers worldwide. 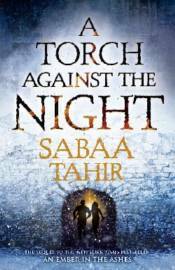 A TORCH AGAINST THE NIGHT takes readers into the heart of the Empire as Laia and Elias fight their way north to liberate Laia�s brother from the horrors of Kauf Prison. Hunted by Empire soldiers, manipulated by the Commandant, and haunted by their pasts, Laia and Elias must outfox their enemies and confront the treacherousness of their own hearts. In the city of Serra, Helene Aquilla finds herself bound to the will of the Empire�s twisted new leader, Marcus. When her loyalty is questioned, Helene finds herself taking on a mission to prove herself�a mission that might destroy her, instead.